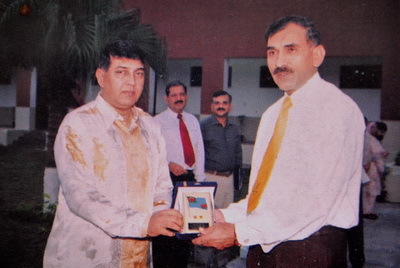 On 11 September, 2005, Chief of the Air Staff, Bangladesh Air Force, Air Marshal Fakhrul Azam visited his almamter. The young Fakhrul Azam (694-Tempest) left the School after completing his Senior Cambridge in 1965. A dashing gentleman wh Mr Catchpole, the then Principal, thought was "a man of character and personality". True to his Principal's insight, he persued a brilliant career and rose to the status of Air Chief. To relive the cherished memories of his golden age, he visited his House, Tempest. Later on he had tea with the School at the School Mess where he mixed with the young Sargodhians and exchanged pleasantries with them. He aslo had a detailed discussion with the newly arrived Bangladeshi students and boasted them to perform well. The writer had the honour to present the visiting dignitary his digitally improved photograph of his School days. 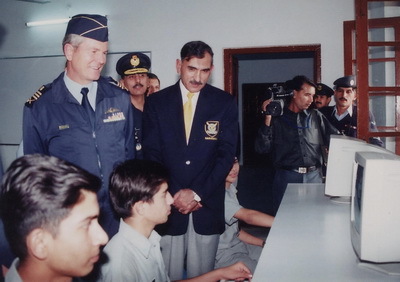 Lieutenant General Carlo Gagiano, Chief of the Air Force, South Africa visited PAF Public School, Sargodha on 12 November, 2005. The distinguished visitor was given a detailed briefing by the Principal Air Cdre (Retd) Abdul Qadir Sargaana and taken for a thorough round of the institution. The honourable guest told the Principal that they are exploring the possibilities of establishing a similar sort of institution in South Africa to tap and nourish young South African talent. He expressed that he was taking with him a very pleasant and useful impression of an efficient set up of the School.